Turkish eggs have become a bit of a brunch staple in Ireland over the last few months, and I always order them if I see them on a menu. When they’re good they’re very, very good, and even when they’re not perfect they’re still very tasty. How could they not be? Harissa, Greek yoghurt and eggs were meant to be together, and the juxtaposition of the tangy, creamy and spicy flavours, along with the interplay of the different temperatures – warm eggs, cool yoghurt – makes for a delicious and oddly calming breakfast dish. The only problem is they’re a little fiddly to make. You have to poach the eggs, foam the butter, watch the toast, mix the yoghurt and then wash all the pans, none of which are trivial tasks on a Sunday morning when you’re hungry and the day is starting to slip away from you. Or indeed when, like me, you can’t actually make poached eggs. 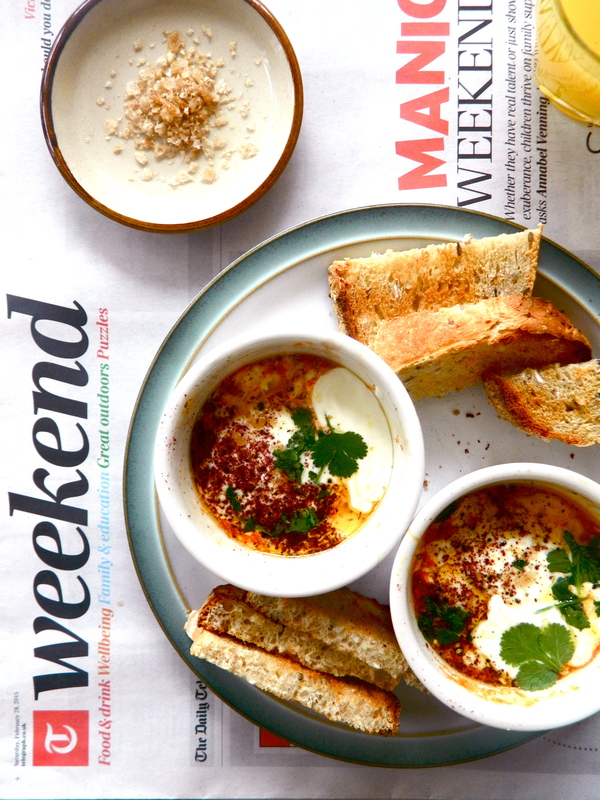 So here’s an easier, quicker, baked version of this new classic: you cook and serve the eggs in a ramekin, meaning less dishes to wash and more time for reading the paper. Preheat oven to 180ºc. Rub a little butter around the ramekins, break the egg in and cover the yolk with a drop of cream. Bake for around 10 minutes, or until the white is set. Take the eggs out of the oven, and add around half a teaspoon of butter and about 2 teaspoons of spicy sauce and return to the oven for a minute or two. While they’re in the oven, dice any herbs, toast the bread (sourdough styles are delicious with this) and if you want your yoghurt a little more flavoursome (plain works fine too), mix in a little diced garlic and a dash of lemon juice. Take the eggs out of the oven and loosely stir a generous spoonful of the yoghurt into the spicy sauce on the top of the egg. Then serve with cool, buttered soldiers of sourdough toast, diced herbs, salt and pepper and a pinch of sumac or smoked paprika.